Founded in 2005 by Parvaz Homay, The Mastan Ensemble has become one of the most prominent traditional Persian music groups in Iran. Only in his twenties, Homay is an exceptional classical artist who composes music, writes his own lyrics, sings and produces his work. His ensemble consists of eight virtuoso Iranian musicians. Their first U.S. performance was a sold-out concert at Walt Disney Concert Hall on July 3, 2008, followed by other successful performances in the U.S., Canada and Europe. Following the path of some of the greatest Iranian poets, Homay’s poetry carries a universal political and social message of peace and harmony. Rhythmic, uplifting and mesmerizing, The Mastan Ensemble plays traditional Persian music in a way that has never been heard before. 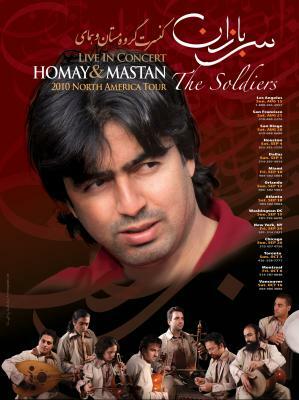 The highly acclaimed Iranian musical phenomenon Homay and the Mastan Ensemble return to Walt Disney Concert Hall for the third consecutive year on August 15, 2010 at 7 p.m. to perform the latest compositions by Parvaz Homay. The Ensemble’s performance of Homay’s operetta “Moses and the Shepherd” at Walt Disney Concert Hall last year was followed by sold-out performances throughout the U.S., Canada and Europe to enthusiastic audiences. The group returns to North America with “Soldiers/Sarbazan”, armed with new and soul-stirring messages of transformation, hoping to raise awareness and compassion. Throughout their world tours over the past three years, Homay and the Mastan Ensemble have performed at some of the most renowned stages, including Walt Disney Concert Hall in Los Angeles, Lincoln Center in New York City, Strathmore in Washington, D.C. and Roy Thomson Hall in Toronto, Canada and continue to be invited back to these concert halls. Parvaz Homay, founder of Homay and the Mastan Ensemble, always strives to push the bar higher by bringing innovation to his music and showcases classical Persian music on the global music scene to help gain the recognition this musical tradition deserves. He is working on several unique musical projects and collaborative efforts and hopes to bring these to fruition in the near future. Before kicking off their world tour in 2010, Parvaz Homay traveled to various parts of the world seeking inspiration for his new compositions, a number of which he will be performing with the Ensemble on the tour. His journey took him to Africa where he sought to connect with nature in preparation for his next concert tour whose theme will be wildlife and environmental protection, and which he will perform accompanied by some of today’s greatest international artists. Tickets and tour details may be found at www.zamanproductions.com and www.homaymastan.com. Media representatives are encouraged to share the message of these talented artists who have had to overcome many obstacles in pursuit of their passion and whose travel to the United States has been made possible by the generous supporters of Persian traditions and music. Samples of their music are available upon request. To be added to the registered Media List, please contact Bita Milanian at 310-994-7930 or bita@bflybuzz.com.